ST. GEORGE – The second annual St. George Ironman began with minimal wind and a clear sky, but the weather warmed up quickly and barred many competitors from completing the race. The bike portion of the race took much longer than expected, and some spectators said the hot temperatures slowed down the competitors. Janet Turchard came to St. George from Las Vegas to cheer for her husband Sean Turchard who has competed in 12 Ironmans to date. Janet said Sean has an advantage in this race because he is acclimated to the dry hot weather. The Turchard’s plan to volunteer at the Las Vegas Ironman that takes place in October of this year. Ed Von Holst and his wife also came to St. George from Buff, Wyo. for Von Holst to compete in the Ironman competition, which will be his second Ironman. 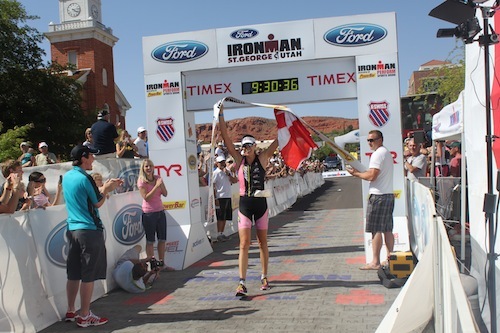 His first Ironman was last year’s inaugural race held in St. George. His wife said his main goal is to beat his time from last year, which was 12 hours. She also said it was almost impossible for him to train for the dry hot weather because where they live in Wyoming there is still snow. This year’s overall winner was Mathias Hecht from Switzerland who finished with an approximate time of eight hours and 32 minutes. Hecht beat last year’s record held by Micheal Weiss who dropped out of this year’s race due to back and muscle spasms. Throughout the race there was no definite winner due to many injuries and setbacks. Jodie Swallow, who was a favored competitor in this year’s race, pulled out early in the run due to a preexisting foot injury. Swallow, Heather Wurtele and Meredith Kessler battled for places during most of the bike course. Because Swallow dropped out of the race that left first place for Wurtele, who is from Canada, second for Kessler, who is from San Franciso, Calif. Unfortunately, Kessler also dropped out of the race midway through the run leaving the second place female slot open for Uli Bromme of Boulder, Colo., who trailed Wurtele by 20 minutes. Wurtele was the female winner of last year’s race and beat her time by approximately five minutes with a race completed time of nine hours and 30 minutes. Great review! I wonder if they’ll move the Ironman earlier in the year next time? It should have been even hotter this time of year!